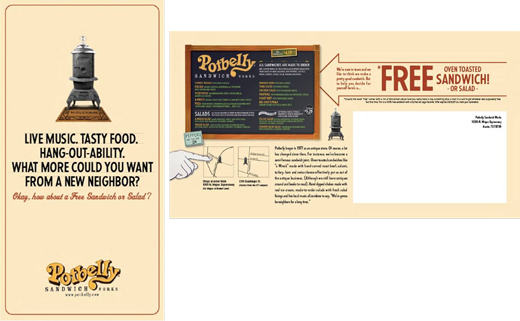 While Potbelly had strong brand awareness in Chicago, in most other markets Potbelly was virtually unknown. For all markets, being a small company with no history of advertising, budgets were tight. The company and local marketing plans had to be as efficient and sales-driving as possible. This included leveraging broadcast, direct mail (direct mail piece shown below had redemption averages well above industry benchmarks), in-store marketing, significant grass roots efforts, special events, charity partnerships, maximizing traffic on the website, internet display advertising, other digital components and programs with significant sales driving potential (like Online Ordering). Created integrated advertising plan for Chicago to officially launch Online Ordering. Efforts consisted of display advertising, website push, advertising in local commuter paper, radio tags, significant in-store advertising, and other activities. Resulted in 25% increase in online sales and led to decision to expand Online Ordering to all markets. Achieved sales growth of 40% during tenure.